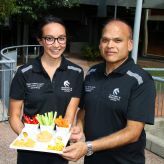 UON nutrition researchers, PhD student Jessica Ferguson and Professor Manohar Garg. Lead researcher Professor Manohar Garg says a common thread with the studies is the increasing threat of metabolic abnormalities for people who are overweight/obese, classified as pre-diabetic, or have high risk for cardiovascular disease. “Metabolic syndrome includes factors such as excess fat around the waist, hypertension, high blood triglycerides and glucose levels, and low levels of what we call ‘good cholesterol’,” he said. “If you have three of these symptoms, your risk of developing type 2 diabetes is five times higher than normal … you’re also three times more likely to develop heart problems. “We’re looking to prevent the onset of these diseases by using nutraceuticals, which include Omega 3 fatty acids, curcumin, plant sterols or a combination of these. The various studies are open to men and women aged 18 to 70. Participants will be monitored through blood and body composition tests along with analysis of their diet and physical activity. Their risk of developing diabetes and heart disease will also be calculated. “Some people may lose weight during these trials but that’s not what we are really targeting,” Professor Garg adds. Along with Professor Garg, PhD student Jessica Ferguson is looking at the cholesterol-lowering and anti-inflammatory effects of new healthy foods containing bioactive compounds. Currently she is investigating the effects of plant sterols and curcumin combined in a dip. They are seeking 80 people with high cholesterol for a four-week intervention to determine if this novel food can lower heart disease risk. “The foods we use will be delicious and versatile so volunteers can easily add them to their regular diet. We hope blood cholesterol, blood pressure and inflammation markers will all reduce – these are the three main risk factors for coronary disease,” Professor Garg said. A third project will take another 70 people who have type 2 diabetes then examine the heart health benefits of curcumin and/or fish oil capsule supplementation, over and above their usual medications and management. Another trial for people with pre-diabetes has the same study design but will examine whether the participant’s risk of developing the disease has been minimised. Researchers anticipate that the combination of tablets will be the most effective, since Omega 3 and curcumin are powerful anti-inflammatory agents. “We are at the halfway point of recruitment for this particular trial but need another 40 people. This has been more difficult because many people don’t fully understand that pre-diabetes is a condition – we can easily determine that for them if they call,” Professor Garg said. The final trial is recruiting expectant mothers by invitation only through John Hunter Hospital to investigate gestational diabetes, which occurs in around 10 per cent of pregnancies. Professor Garg said expectant mothers will receive Omega 3 supplementation to improve the quality of fatty tissue gained during pregnancy. All trials are based at the University of Newcastle Callaghan campus. * Professor Manohar Garg researches with the University of Newcastle’s Nutraceuticals Research Team in conjunction with HMRI’s Cardiovascular Research Program. HMRI is a partnership between the University of Newcastle, Hunter New England Health and the Community.